The 'people [portraiture]' category is a subcategory of my people category. Another early morning shot from our Venice Carnival Photo Tour. When I first edited this image I produced something that looked very similar to the original, as I have another shot of this guy that tells a much better story so this one would have made a good comparison, but the more I looked at it the less I liked it: it was drab, the light was dull and flat, and the mood was wrong. It's just a guy, in a costume, against a fairly bland background. The final version is an attempt to tell a more sympathetic story. That said, I'm out of my comfort zone with this one so would be interested to hear whether you think this works. 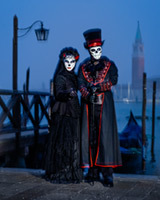 Another early morning shot from our recent Venice Carnival Photo Tour. Here's another shot from our 2016 Venice Carnival Photo Tour, taken early yesterday morning down at St. Mark's Square. When I took this shot of Libby I was drawn by the contrasting colours and the way her clothes and boots matched the autumn landscape, but when I processed it it was the shape and form that held my attention - the colours became distracting. This is definitely one of my favourite portraits in recent months: a shot of our good friend Dionne, shot with an IR converted X-E2 and the new 90mm f/2. If you're a Fuji shooter you'll already know that all their lenses are good, but the 90mm is truly excellent, even wide open. I'd definitely recommend you try it out if you haven't done so. This is a follow-up to the shot I posted yesterday, and while I like the abstract quality of that one I much prefer the almost surreal feel to this one. On this occasion he complicated things by grabbing the guy on the left. They may know each other, but the impression I got at the time was that he was just standing there minding his own business - hence the rather puzzled expression. So, not exactly a candid shot, nor much of an environmental portrait, but I like it nonetheless. This was taken about four minutes after the shot I posted yesterday, and despite the fact it was shot in exactly the same way it's quite different. To explain: while I was shooting this images I intended them to be silhouettes (or thereabouts) and I was shooting while Issa was attempting a slightly more sophisticated shot. He had a Profoto B1 set up on the beach, with a zoom reflector, pointing at the fisherman as he repeatedly threw the net for us. 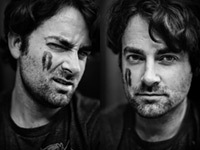 His one a one-shot deal, I had the benefit of being able to shoot the entire sequence. We did this about three or four times before Issa was satisfied he'd got the shot. So he got three or four images, I got about 40. Most of mine were very similar to yesterday's - the same light, the fisherman close to being silhouetted - but this one was different as I caught Issa's light during the exposure. This shot was taken on the same evening I photographed Issa, shot using a Nissin i40 flash with the Wescott Rapid Box 20" Beauty Dish. Something a bit different today, taken during our recent Venice Carnival Photo Tour, and processed using a variety of textures and borders. On a related note, we've just started accepting bookings for 2016 and four of the twelve places are already booked. If you think you might be interested in joining us please take a look at the following link. After snivelling around the house for the last couple of weeks with man-flu I thought it was about time I posted something, and as I'm heading off to the Venice Carnival again next month I thought this was a good choice.